1 Evenly spread bread with goat cheese. Top 1 slice with spinach and roasted peppers, then remaining bread. 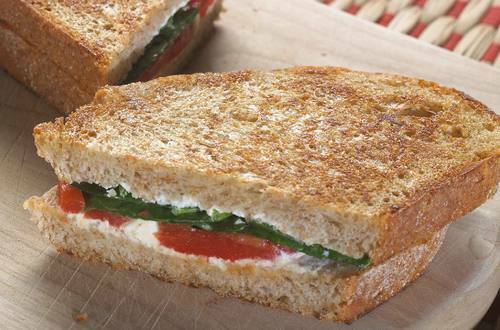 Spread outside of sandwich with Hellmann's® or Best Foods® Real Mayonnaise. 2 In 10-inch nonstick skillet, cook sandwich over medium-heat, turning once, 4 minutes or until golden brown and cheese is melted. Serve, if desired, with your favorite soup.